This impressive natural Smokey fox blanket is a unique item piece. The fox blanket is made of high-quality Scandinavian foxes. Perfect for indoor use to provide continuous warmth in chilly weather, especially for the autumn and winter season. Smokey foxes have a very silky hair with a dense, warm undercoat. The fur blanket is ideal for an afternoon nap in bed covering with our 100% real fur blanket. Lars Paustian guarantees you only the best quality. Our tailor and skinning masters from Kiel work only with the highest quality materials to give you the quality you want. If you have any questions about this Canadian Red Fox Fur Blanket, please do not hesitate to contact us. The smokey fox (alopex lagopus forma domestica) is a farmed fox from Scandinavia. Smokey foxes are rare foxes, and they are characterized by their unique and individual color pattern. The hair of the fox skin is soft, silky and compared to other farmed foxes rather long-haired. The color is very similar to that of the cross fox, but usually a little brighter and more golden. Responsible handling of the natural product fur is very important to us, and therefore we always purchase our smokey fox skins from the SAGA Furs in Finland or the Copenhagen Fur auction in Denmark. If you decide to buy a product from Scandinavian smokey fox, you can be sure to receive a first-class fox fur product from excellent Scandinavian fur farms. 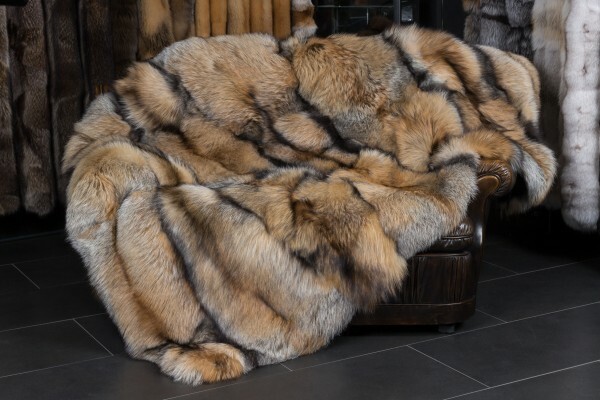 All our smokey fox fur blankets, fur pillows, and fur accessories are produced by our master furriers in our company in Germany. If you have any questions or requests, please do not hesitate to contact us. Related links to "Natural Smokey Fox Blanket"
Customer reviews for "Natural Smokey Fox Blanket"
I bought one of these blankets back in November, and it just exceeded all expectations. The fur is very long and dense, and the coloration is just stunning. The furs came from SAGA and are of the highest quality in every way. There is no such thing as a cold night with a blanket like this even if you turn the heat down, and once you sleep in one you'll never want to sleep in anything else.